Saint Jerome in penitence is one of the episodes from the life of a saint whom Ribera depicted on a number of occasions throughout his career, as with the theme of the Pietà. The life of Saint Jerome, one of the four Doctors of the Church, author of the Vulgate and secretary to Pope Damasus who commissioned him with the new Latin translation of the Bible, was disseminated through The Golden Legend by Jacopo de Voragine, along with the lives of numerous other saints and martyrs. The figure of Saint Jerome, along with that of other contemplative saints and female anchorites such as the Magdalen, was promoted during the Counter-Reformation, which saw these spiritual episodes as perfect examples of repentance and which also fulfilled the requirement of moving the spectator to piety. 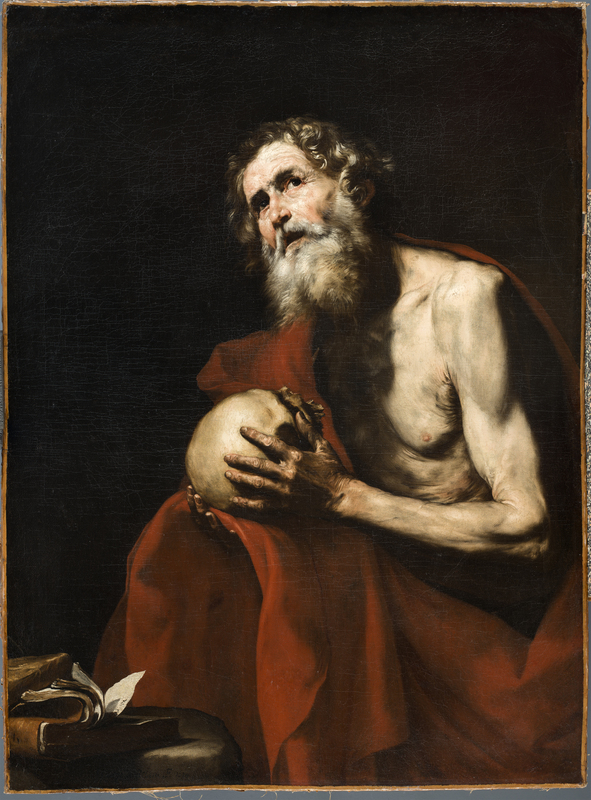 One of Ribera’s earliest known depictions of Saint Jerome dates from 1616–17 and was painted for one of his patrons in Naples, Pedro Téllez Girón, Duke of Osuna. In that work, now in the collegiate church of Osuna, Seville, Saint Jerome is depicted in meditation holding a skull and lying on the ground in his cave listening to the trumpet of the Last Judgement played by an angel. Another canvas of 1626 in The Hermitage, St. Petersburg, depicts the same subject but with a different composition. In that work the saint, surrounded by his symbols including the lion, is interrupted in his labours by an angel with a musical instrument. In the present canvas Saint Jerome does not have the landscape background seen in the Osuna version and seems to have paused in his meditations as he looks up. Despite the fact that it was executed in the 1630s at a time when Ribera’s palette lightened, it is painted with an intense tenebrism that recalls the style of Caravaggio. The saint’s body is partly covered by a deep red cloak, leaving some of his body exposed. This is painted with a precise brushstroke that reveals the wrinkles and bones that poke though his flaccid, leathery skin. His rough hands are painted in warmer tones than the rest of the skin, thus emphasising the presence of the skull that he holds up on the folds of his cloak. Ribera paid great attention to all the details in the composition and to the different textures of the materials, conveyed, for example, in the different rhythms of the brushstroke through which he captures Jerome’s hair, and the long and short strokes used for his white beard. This careful handling is also evident in the expressive, simple still life of two books resting on a stone at the lower left corner. The present canvas entered the Thyssen-Bornemisza collection in 1981 from the New York art market. It had previously been in a private collection in Geneva and in another in France, whose owners had acquired it on the Paris art market.